Developing asphalt mixes to provide improved resistance to grey water damage in the Cape Town metro. Working group on Performance Graded binder specification for SA, currently under implementation. Research into adhesive properties of binders used for seals and the influence on bitumen bond strength under adverse weather condition. Advanced evaluation of innovative technologies in bituminous materials, including fatigue and rheological testing on EME asphalt, Warm Mix asphalt and others. Development of Seal Models in order to analyse performance of thin surfacings in a pavement structure. The development of Bitumen Stabilisation Technology using Foam and Emulsion binders as well as Best Practice Guidelines such as Technical Guidelines 2. On receiving the award, Prof Jenkins was quick to add that every project has been a group effort and requires skilful co-operation from a number of role players in the roads industry. He thanked Sabita for the support provided and the continuous drive to take research findings and effectively and practically implement them for the benefit of the industry. 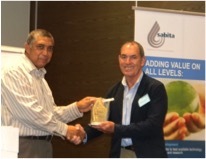 Sabita has also been pivotal in giving recognition for outstanding performance in Health & Safety practices to individuals within the bituminous industry. 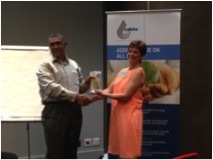 This year was no different as the winners were announced at the Annual Awards function held in Gauteng during March. The first recipient was Caroline Marais of Bituguard, a small and very well run operation in Bethlehem in the Free State. Caroline has been with the company since day one and understands every aspect of the business. She progressed from Laboratory assistant to Plant manager and had to follow a steep competence development programme to ensure she was adequately equipped to deal with the stringent demands placed upon her. Her desire to learn new things as well as her people orientated management style is surely a recipe for a successful and safe work environment. The last and only LTI experienced at this plant occurred more than 16 years ago. Caroline gives credit to her team of committed workers and has the assurance that she can depend on their continuous support. Well done Caroline Marais! The second award was to the staff of the Colas SA Bitumen Depot in Durban – a first time nomination for a group since the launch of the CEO Award in 2010. A very proud Mitch Schafer, the branch manager was on hand to collect the award on behalf of his team and had this to say “everything we do is a team effort and it’s expected that we do it well!” The results of this safety principle were evident to the evaluation team when they spoke to members of staff randomly. They demonstrated that the corporate HSE culture within the Colas Group is keenly supported and applied to day-to-day operations. Congratulations to Colas SA Bitumen Depot!